Wildfires had been burning in the Great Smoky Mountains for a few weeks (see previous blog posts) as extreme to exceptional drought persisted over the region. 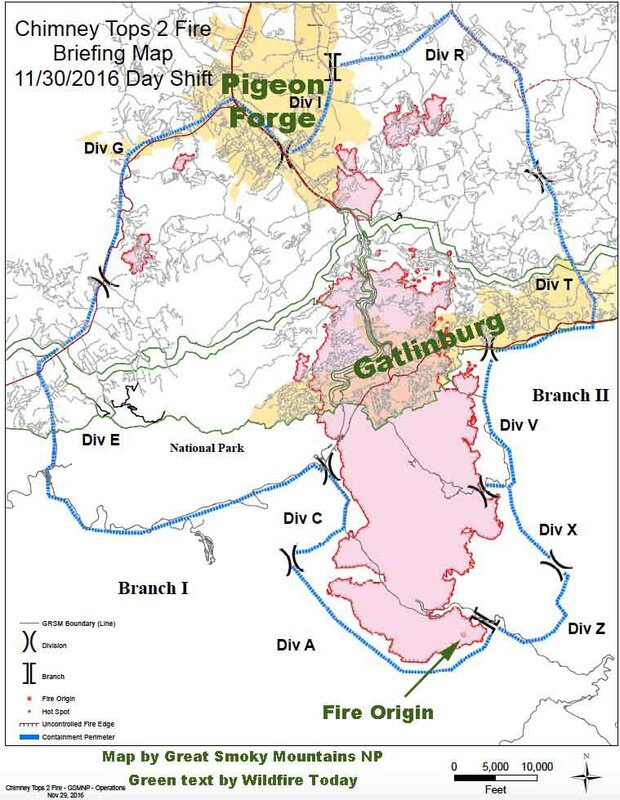 However, on 28 November 2016 weather conditions became conducive to extreme fire behavior — and this allowed the Chimney Tops 2 Fire south of Gatlinburg, Tennessee to race rapidly northward (fire perimeter map), driven by strong southerly winds gusting to at least 30-40 knots (as were recorded in Knoxville KTYS, located about 25 miles northwest of Gatlinburg). Widespread evacuations were necessary, and at least 13 fatalities were reported. 4-km resolution GOES-13 Shortwave Infrared (3.9 µm) images (above) showed the development of a fire “hot spot” (the cluster of pixels at the center of the images exhibiting a black to yellow color enhancement) during the day, before clouds moved overhead to mask the fire hot spot signature. The warmest infrared brightness temperature seen during this time period was 326.8 K (brighter yellow pixels) on the 1700 UTC image. Even though cloud cover was increasing, a detailed view of the fire hot spot was provided by an AWIPS II image of 375-meter resolution Suomi NPP VIIRS Shortwave Infrared (3.74 µm) data at 1815 UTC on 28 November (below). An AWIPS I version of this image is available here. Due to the cloudiness, no discernible hot spot appeared on the lower-resolution 1815 UTC GOES-13 Shortwave Infrared image. An AWIPS II image comparison of VIIRS Infrared Window (11.45 µm), Shortwave Infrared (3.74 µm) and Day/Night Band (0.7 µm) data at 0816 UTC on 29 November is shown below. Cloud-top Infrared Window brightness temperatures were in the -40 to -55º C range over the fire region (such air temperatures were foundd within the 9.5-10.5 km altitude range on the Nashville sounding when the cloud band was over central Tennessee at 00 UTC). While no fire hot spot signature was evident on the Shortwave Infrared image (due to masking by the clouds), the very distinct bright glow of the fire (which appeared rather large in size, due to scattering of light by the water and ice particles present in the various cloud layers) was seen on the Day/Night Band image. AWIPS I versions of these images are available here. Additional information is available on the Wildfire Today site (post 1 | post 2 | post 3 | post 4 | post 5).